Any quantity only $5.99 per oz over spot! While private refineries and sovereign mints focus on the production of silver bars with intricate details and highly refined finishes, there are other private mints focusing on the production of something entirely different. MK Barz is among many private refineries that offer investors and collectors the chance to buy silver bars online that are truly unique. 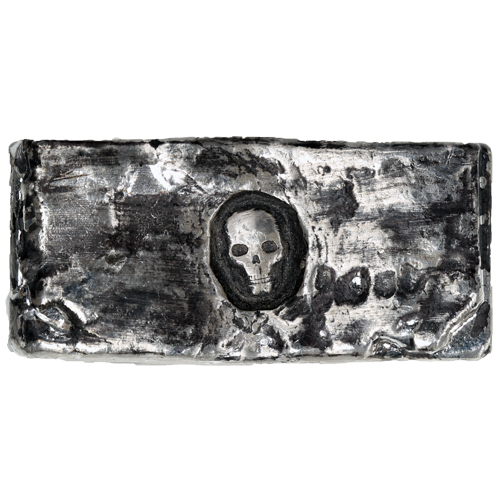 Right now, the 3 oz MK Barz Silver Hand Poured Rugged Skull Bar is available to purchase online at Silver.com. Obverse includes the skull finish. Each of these 3 oz MK Barz Hand Poured Rugged Skull Silver Bars has been produced using the most ancient of refining techniques. The molten silver is poured, once heated to its melting point, by hand into a pre-formed mold. It is then left in that mold to cool while engravings and other markers are hand stamped into the surface. There is something meaningful to be said of the rugged finish to these bars. While minted ingots offer a refined, polished appeal, there are those investors and collectors that prefer the antique and ancient finish of products refined using the most historical of production techniques. 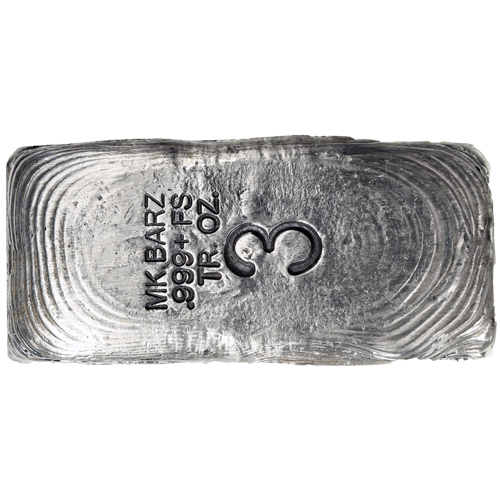 On the obverse of these 3 oz MK Barz Silver Hand Poured Rugged Skull Bars you’ll find a rough, simplistic finish to the bar’s design. A small human skull with minimal visible features has been stamped into an oval-shaped region in the center of the bar’s design field. The overall finish is rugged and far from smooth, with uneven lines. The reverse of all these silver bars includes an engraving of the refinery’s name, the purity of the metal, metal content, and the weight of the bar in Troy ounces. The finish is so rough on this face that you can actually see the lines where the poured silver cooled into place while it set in the mold. Hand-poured silver is unique in that no two specimens are exactly like. Rather than being viewed as a flaw, many collectors find this trait to be valuable as their pieces are different from all others, even when produced in the same batch and design set. MK Barz is a refinery located in Los Angeles, California that opened in 2014. The refinery focuses on the production of silver bars and other bullion products with a minimum silver content of .999. The company was founded by an individual with 35 years of experience grading and collection American coins. If you have any questions, please don’t hesitate to contact Silver.com. Our customer service team is available to you on the phone at 888-989-7223, on the web using our live chat, and via our email address.